On the 31st of July in 2008, East Coast Jets flight 81 departed Atlantic City International Airport carrying two pilots and six passengers for a non-scheduled domestic passenger flight to Owatonna Degner Regional Airport in Owatonna, Minnesota. Two and a half hours later, they were dead. This crash is interesting to me because at first glance, it looks like the flight crew simply didn’t care. They didn’t follow procedures and the cockpit resource management was severely lacking. Only once investigators began to look beyond the surface details did it become clear how the situation had degenerated so rapidly. East Coast Jets is a Part 135 operator, that is, they offered commuter and on-demand operations; effectively a very small airline. Part 135 rules cover non-scheduled charter and air taxi operations, with fewer regulations and restrictions than Part 121 rules which cover regional and major airlines. The accident aircraft registration N818MV photographed by Paul Kanagie a year before the crash. 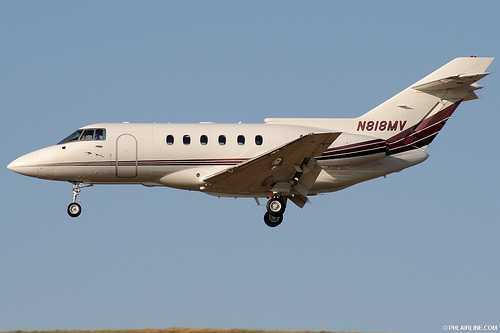 Flight 81 was a five-leg flight in a Hawker Beechcraft 125-800A, chartered by an Atlantic City entertainment company. The first leg was a repositioning flight from Lehigh Valley International Airport in Pennsylvania to Atlantic City International Airport in New Jersey. There, they picked up six passengers for the flight to Owatonna. The departure from Atlantic City and cruise were uneventful. The captain was the Pilot Flying and the first officer was the Pilot Monitoring. During the descent the aircraft encountered bad weather and a tailwind. Minneapolis Air Traffic Control warned the flight crew of ‘extreme precipitation’ 20 miles ahead and recommended that they not fly through it but instead deviate off their course to the right. There was no Flight Data Recorder (FDR) on the aircraft (nor was there any requirement) but the Cockpit Voice Recorder (CVR) recorded the flight crew’s frustration with the weather and the controller along with the sound of rain pounding the windscreen. First Officer: Doesn’t it figure [weather] pops up right when we get there? Captain: What do you mean, what are my intentions? Get me around this storm so I can go to the field. I ain’t gonna turn around and go home. The Captain didn’t bother with an approach briefing. The Rochester approach controller warned the crew that the weather information they had picked up was twenty minutes out of date. The flight crew also didn’t bother to check for up-to-date weather information. They must have seen by now that the wind that morning was very variable but they didn’t seem to think it important. As a result, they continued their approach to runway 30 in a tailwind, rather than considering the possibility of landing on runway 12 with a headwind. The impatience in the cockpit did not seem to be typical of this captain, who was described by other pilots at the company as serious and meticulous. They said that in their experience, the captain carefully monitored the weather during a flight and had previously diverted flights in bad weather, despite pressure from the passengers. One pilot described a flight with the accident captain in which a high-ranking official was a passenger. The flight was scheduled to land at Cedar Rapids, Iowa. Although the weather forecast was legal for IFR conditions, it was marginal. According to the pilot, the captain called [flight service stations] repeatedly during the trip, determined that the weather was deteriorating, and decided to divert to the next scheduled stop at Des Moines, Iowa. The captain maintained his decision even though the travel arranger, who was also a passenger, came up to the cockpit, indicated that the high-ranking official was unhappy with the decision, and tried to talk the pilots into landing at Cedar Rapids despite the weather. That morning, inbound to Owatonna, he seemed a lot less patient, although there’s no clear reason why. This flight was not running late and there’s no evidence that the passengers put any pressure on the crew. And yet, the captain and the first officer repeatedly voiced their frustration with ATC and the weather. They continued their descent as they changed frequency to Minneapolis approach control. The captain took over the radio while the first officer attempted to contact the fixed-base operator at Owatonna to find out how to get fuel once they were on the ground. As they descended to 7,000 feet, the captain said, “let’s do the approaches real quick,” meaning the approach checklist. The first officer started the checklist but was almost immediately interrupted by the controller, who cleared them to 3,000 feet and gave them a weather update. The flight crew then discussed the weather radar display which appeared not to be working. Captain: I don’t know what we’re looking at on this thing. First Officer: Well, neither do I. I don’t know if it’s not working. Captain: Is that ground? Because I got it pointed way up in the air. You know I got it going down, I got it pointed up. First Officer: Is that showing a storm? The controller called again to say that there was light precipitation along the entire remaining route and a couple of heavy storm cells at 5 miles north and northeast of Owatonna. Meanwhile, the sarcastic comments in the cockpit continued. Captain: The sooner you get us there, the better. First Officer: Why don’t they just get us to the field? Then the captain declared that that approach checklist was complete. This wasn’t his call. The first officer, who was the Pilot Monitoring, was responsible for verifying that the checklist was complete, not the captain. More importantly, the checklist was not complete, as the first officer had been interrupted a few minutes before and had not gone back to it. However, the first officer didn’t argue but made the same call: “Approaches are done.” He tried twice more to get through to the FBO at the airport with no response. His attempts to call them, which was really not essential at that time, were frequently interrupted by discussion with the captain and radio calls. The work load was high and as they were under 10,000 feet, the ‘sterile cockpit rule’ applied. This is a general prohibition on non-essential duties or activities while the aircraft is involved in taxi, take-off, landing and all other flight operations conducted below 10,000 feet except cruise flight. The point is to keep the pilots focused during critical phases of flight with a clear-cut rule that allows for chatting, sight-seeing and interruptions by cabin crew during other times. The first officer’s calls to the FBO were not just contravening the sterile cockpit but it clearly caused him to be distracted from his primary responsibility: complete the approach checklist and monitor the flight instruments. The captain had to remind the first officer to identify the localizer frequency, as he had fallen behind on his duties. But as the captain configured the aircraft for the ILS (instrument landing system) approach to runway 30, he prompted the first officer to try again to contact the FBO. The captain reported the runway in sight and cancelled the ILS flight plan in favour of a visual approach. 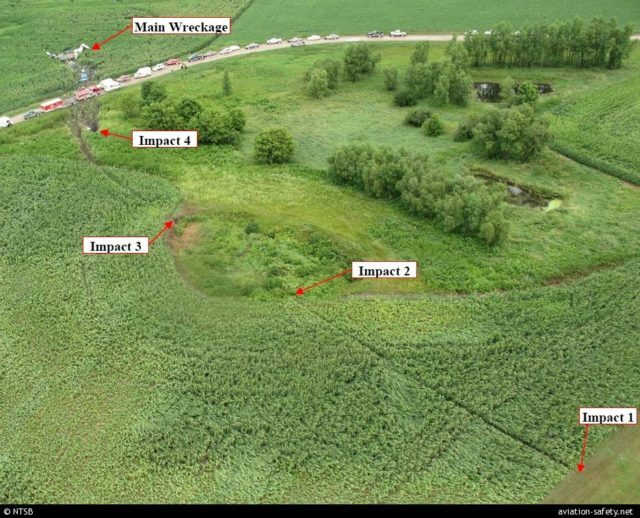 Rochester approach control contacted the aircraft and the captain responded, although that would normally also fall to the first officer as the Pilot Monitoring. The lack of good Cockpit Resource Management meant everything was getting into a muddle. The first officer started to take over the conversation with Rochester approach control when he finally got through to the FBO. The captain continued speaking to Rochester approach control while the first officer told the FBO that they were about eight miles out and asked them about parking and fuel. The captain spoke to the controller regarding local air traffic. He lowered the landing gear and then made a series of quick calls. Captain: Three green, no red, pressure’s good, back to zero, steerings clear. This means that the three green landing gear lights were on (which means that the landing gear were all in the down-and-locked position), that the hydraulic pressure was good, that the air brakes had zero pressurization and that the nose-wheel steering handwheel was clear. This is a rather speedy version of the Before Landing checklist items, which are usually done as challenge/response: one crew member calls out the checklist item and the other checks and verbally confirms the state. Two minutes before touchdown, the first officer finished his call and then briefed the captain on what they were doing on the ground, his account of their activies after landing were much more detailed that the one-sentence approach briefing they’d conducted earlier. The captain called for “flaps two” (set the flaps to 25°) and asked for the Before Landing checklist, although he’d already effectively run through it. Neither pilot confirmed flaps were down or what setting was selected, the final item on the checklist, although the captain did say “down indicating down” which probably meant he had set full flaps (45°) for landing. This time, neither pilot stated whether the checklist was complete or not. Both pilots repeatedly failed to conduct checklists appropriately and verify verbally that the checklists had been completed, demonstrating that neither was focused on proper checklist execution. Checklists should be accomplished crisply, using the precise challenge and response checklist items. The captain had the ultimate responsibility to demand a more professional and disciplined tone in the cockpit and to manage workload so that secondary tasks, such as contacting the FBO, were not a distraction during critical phases of flight when crew coordination is necessary. The first officer was fully qualified to support the captain in areas of weather observation and monitoring, and the captain should have made better use of the first officer. Runway 12/30 at Owatonna is 5,500 feet (1,676 meters) long, which is enough for the Hawker Beechcraft 125-800A but doesn ‘t leave a lot of room for the landing roll, especially when the runway is wet. In addition, they had a tailwind, which meant that they were going to have to decelerate fast once they landed. Because the runway was ungrooved and wet, the friction would be low (Edit: see comments below), which means maximum braking power would not require maximum braking forces: there was no benefit to full brakes and the anti-skid system would likely to release brake pressure to avoid locking the wheels. The flight crewmembers exhibited poor aeronautical decision-making and managed their resources poorly, which prevented them from recognizing and fully evaluating alternatives to landing on a wet runway in changing weather conditions, eroded the safety margins provided by the checklists, and degraded the pilots’ attention, thus increasing the risk of an accident. The CVR recorded the sound of the aircraft touching down. According to the performance study, the aircraft crossed the threshold at 122 knots, touching down about 1,128 feet from the runway threshold, which is within the target touchdown zone (the first 3,000 feet of the runway). The captain applied the brakes. The aircraft tyres and tyre treads were in good condition. The drainage on the runway was good and there was no standing water on the runway. There was no reason why the aircraft shouldn’t decelerate normally. Three seconds after touchdown, the CVR recorded a sound consistent with the the air brake moving to the OPEN position. The air brakes create drag in order to slow the aircraft down. Part of that system are the lift dumpers, ground spoilers which are used to ‘dump lift’ when on the ground. The lift dumpers can only be deployed and fully extended once the aircraft weight is on the wheel. The loss of the lift increases the weight of the aircraft on the wheels and the full flaps and air brake deflection are what cause the aircraft to decelerate. First Officer: We’re not dumped. Normally the lift-dump system is deployed immediately after touchdown. 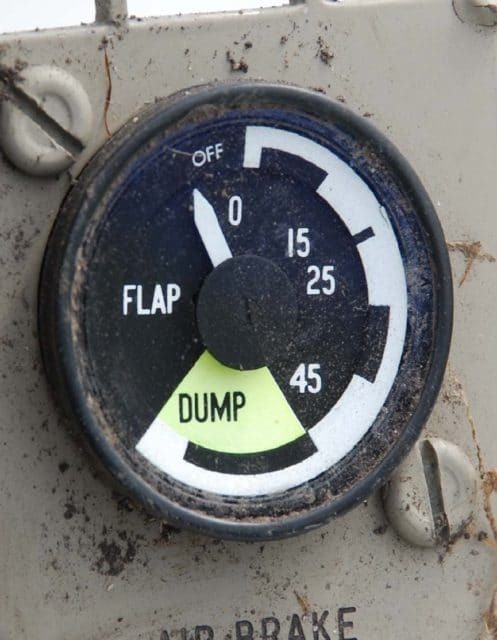 You deploy lift dump by pulling the air brake handle back to the DUMP position in a single movement. However, based on the sounds recorded by the CVR, the captain only moved the air brake handle to the OPEN position instead of pulling it all the way to the DUMP position. On the CVR recording there is a straining sound consistent with physically attempting to move a cockpit control. Then there is the sound of the air brake handle moving into the DUMP position. The lift-dump system was fully deployed but a full seven seconds had elapsed since touchdown. The aircraft was now travelling too quickly to be able to stop in time. They were going to hurtle off the end of the runway. There’s no procedure in the operator’s manuals for attempting a go-around after landing and deploying lift dump. An East Jets representative said that if the situation arose, they would expect the flight crew to execute a normal go around. On the other hand, one of the Simcom instructors who had trained the flight crew said that he’d never conducted a go-around after deploying lift dump and that he did not teach or recommend doing such a manoeuvre, which he described as a good way to crumple the airplane. The captain’s most recent simulator instructor said that once you’ve deployed the speed brakes or lift dump on landing, you just need to ride it out. Another East Jets pilot who, like the captain, flew both Hawker Beechcraft and Learjet aircraft, said that the Learjet 35 was a rocket during a go-around but that the Hawker, although it responded quickly, did not climb as well as the Learjet. What none of these people seemed to know was that Hawker Beechcraft 125-800A has what’s called a ‘committed-to-stop’ point, which is defined as once the lift dump had been deployed. This was not part of the standard approach briefing but to be fair, the captain hadn’t actually conducted the standard approach briefing anyway. The simulations done after the fact showed that if they’d continued and allowed the aircraft to overrun, it would have been travelling between 23 and 37 knots (26-42 mph or 42-68 k/ph) as it went over the end of the runway. The runway safety area at Owatonna Degner Regional Airport is 1,000 feet of grass, so the Hawker could easily have come to a halt in this area. However, they did not continue. There was silence in the cockpit for ten seconds, and then the captain called out “flaps”. Seventeen seconds after touchdown, the captain initiated a go-around. Calling out flaps was his way of signalling this, an abbreviated call specifying the degree of flaps required for the go-around, which both pilots would have known was flaps 15. The only reason to extend the flaps would be to take off again. However, the crew were not prepared for a go-around. The captain had not conducted the approach briefing and the flight crew had never discussed the missed approach procedure for the airport. The decision should have made quickly but the captain waited ten seconds, perhaps not immediately realising that the aircraft was not decelerating fast enough. He may not have accounted for the tailwind and higher ground speed at touch down. Seventeen seconds after touch-down on a thousand foot runway was way too late to be deciding to go around. There was not enough time to configure the aircraft and accelerate. To make matters worse, the captain simply called ‘flaps’, by which he clearly meant to start the go-around sequence. Now he might have assumed that the first officer would know what he meant. But the first officer didn’t react. The flaps were never extended, they remained at 0°. Neither pilot took responsibility for configuring the aircraft for the go-around, making it even less likely that the aircraft would become airborne. The truth was, it didn’t matter. The overrun was already inevitable and would have happened whether the flaps were set to 15° or not. The aircraft was not capable of making it off the ground before they ran out of runway. The sound of the engine increased as they spooled up. The aircraft was swiftly approaching the grassy safety area. By increasing the thrust and leaving the flaps at 0°, they simply insured that the overrun would be as bad as possible. The Hawker hurtled off the end of the runway and continued at high speed through the grass, leaving tyre tracks along the length almost to the end. Then, 34 seconds after touchdown, the aircraft finally lifted off, now 978 feet past the runway. As it crossed over the end of the overrun, the aircraft rolled into a 90° bank. At the far end of the safety area was the runway 30 localizer antenna support structure. The aircraft crashed straight through it at a point about 5 feet above the ground. The aircraft broke up into pieces. 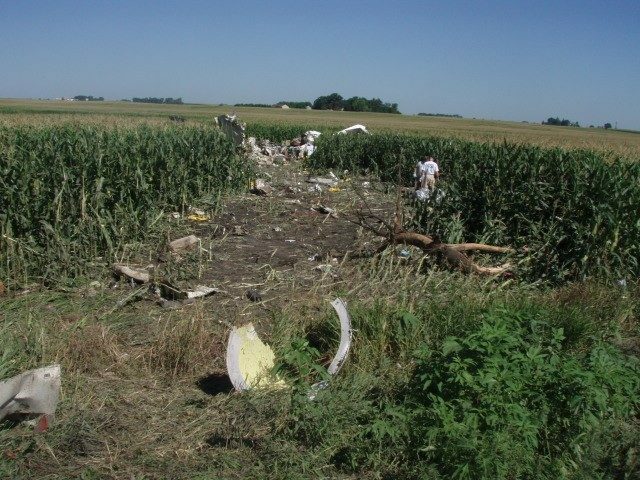 The cockpit and cabin seats and furnishings formed a debris trail to where the remaining wreckage came to a stop in a cornfield on the other side of the road. The wreckage was about 2,100 feet from the end of the runway. One passenger was found alive, however she died at the hospital less than two hours after the accident. Everyone else died on impact. There’s no real mystery in what happened. Clearly, the accident was the direct result of the captain’s late decision to go around instead of attempting to bring the aircraft to a halt in the runway overrun area. But it’s too simplistic to put it down to a bad decision in the heat of a moment. Both pilots had undergone training. Their safety records were good. Their peers described them as competent and professional. Then we have the cockpit recordings, which tell a different story. Their cockpit resource management was poor; the two pilots were not acting as a team and were not focused on the approach and landing. Both engaged in casual conversation below 10,000 feet and the captain appeared happy with the first officer making calls to the FBO, rather than monitoring the aircraft and completing checklists. This doesn’t sound like what we usually mean by ‘competent and professional’ in a cockpit environment. Simply documenting this flight has taken long enough, but I will follow up soon with a second post, one that focuses on the factors before the flight which contributed to the final crash. We wait with baited breath for the follow-up. “Because the runway was ungrooved and wet, the friction would be high..” This looks like a typo. In fact, the opposite: friction would be low and there even could be a risk of aquaplaning. All very good reasons to select a high flap setting and operate the lift dump at once upon touch-down. With a properly functioning anti-skid system there would have been EVERY reason to stamp on the brakes, especially on a short, wet runway and with a tailwind. Normally, NO jet aircraft is supposed to land with a tailwind component of more than 10 kts. Because no figures have been determined about the stopping distance beyond that. And in general, not just on the HS 125 but in just about any aircraft it is a very, very bad idea to try to abandon the landing after the wheels have touched, brakes (and flaps) have been applied and lift has been dumped. Even a Lear 20 series, the “pocket rocket”, might not have made it. As Sylvia correctly describes: the irrational decision of the captain to attempt a take-off changed the situation from an embarrassment into a deadly accident. So what happened? An undetected flaw in the cabin pressurization that caused mild hypoxia in the crew? You mean “bated” breath. It means halted or suspended. It is cognate to “abate” and “rebate”. We are so anxious for the follow-up that we forget to breathe. “Baited” breath would mean waiting by a mouse hole after eating cheese. You are right, the friction comment is completely non-nonsensical. I have fixed it with a note to look here. For clarity, the available friction was only about 20-30% of that available on the dry runway. The report also concluded that the runway had less than 3mm (0.12-inch) water on the surface and the aircraft did not hydroplane. Ah now, we are talking “aviation”, not doing a school spelling check ;-) but yes, Harrow is right. Joking aside, my comment about aquaplaning was intended to be taken in a general way. This is a reason why it is mandatory and actually part of airline training to make positive contact with the runway in the event of landing on a damp or wet surface. A silken-smooth landing may please the passengers, but can actually be the difference between aquaplaning, or not. Essentially, the aircraft tyres push a wafer-thin layer of water, like a bow wave, enough to lift and prevent the wheel from properly spinning up. But there is sufficient friction to generate heat. The little bit of water between tyre and tarmac forms steam. This in turn can reduce the friction even further, even to near-zero. Yet, a tyre that is subject to aqua- (or hydro-) planing can develop flat spots on the tread (spelling correct this time, Harrow?) that may demand immediate replacing. If the aircraft makes firm contact with the runway, the tyre can break through the layer of H2O and make proper contact for braking. Sylvia mentions factors “before the flight”. My simplest guess, a case of unrecognised hypoxia, may explain why a crew that had a previous very good professional record suddenly abandoned all good practice and threw procedures in the wind. But that would not have occurred until well into the flight, not before. Lack of rest? ‘Their peers described them as competent and professional’. So why would they have accepted to do a flight if they were too tired? Yes, a company, especially a small Part 135 operator, can on occasion put severe pressure on crews to continue even if their rest has been compromised or even been inadequate. Commercial pressure, a company at risk of going under, sometimes can make a pilot do things that (s)he should not have agreed to. Well, we have a few more days to wait and read what factors caused a professional crew to suddenly act in a highly unprofessional manner. Reading that is high on the list of recommendations. Because: If there are any professional pilots, or would- be pilots amongst the readers, this in all probability may contain a very valuable lesson. A lesson that may well, some day, be the difference between life or death. I’ve seen you look at other accidents before involving Part 135 operators and small or ‘business’ jets. To me it seems like their are a lot of them – how do accident and fatality rates for them compare to Part 121 operators and to general aviation? That’s a good question. I’ll finish this up tomorrow but one of the issues that comes up is the expections on 135 vs 121 operators. It’s worth looking into.